We kicked off one of the biggest shows of the NOTBPW Calender, with a huge pyro display, and the announce team on our screen!! 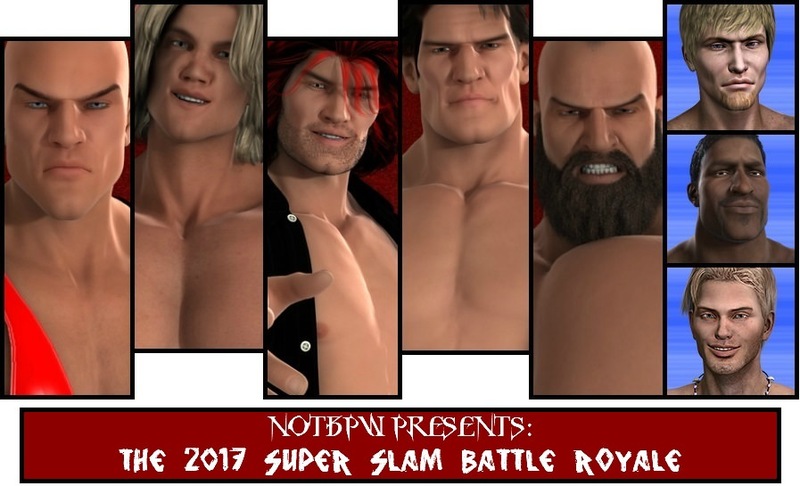 Michaels, Townsend and RDJ spoke about the night ahead, and hyped up the 2017 Super Slam Battle Royale!! Favourites for the match include Sean Deeley, Tim Westybrook, Mighty Cavanagh, James Hernandez, and of course Ricky DeColt!! A 'dark horse' for the victory might be the new signing to NOTBPW: 'The Ace' Aaron Andrews!! 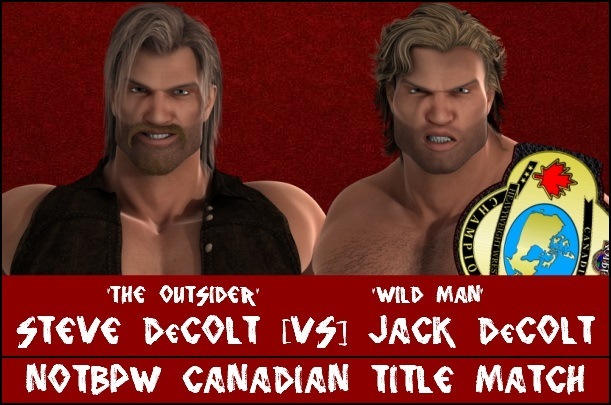 The winner of the Battle Royale will go on to Mid Summer Madness to challenge for the NOTBPW Canadian Championship!! That man, will face the winner of tonight's co-Main Event: Steve DeColt versus Jack DeColt!! This was an absolutely incredible match, and proof that just because you're on the 'Time Decline' list, doesn't mean you don't have a future here on NOTBPW. The Natural and Owen Love are on that list, and their win/loss record of late is questionable. Tonight, they were up against fellow former NOTBPW Tag Team Champions in Cameron Vessey and Christian Price. The young, flash, competitors out-shone The CanAm Blondes for a little while, as they isolated Natural in their corner. For a few minutes, they focused solely on his back. They injured it by shoving him onto some ring steps two weeks ago. He needed to make the tag to his partner Owen Love, and he fought hard to try to get there. Eventually, Love came in to a huge roar from the fans, and he began taking down Vessey and Price with stiff strikes; particularly elbows! For the finish, once things broke down into utter chaos, Love managed to hit his 'Love Gun' finisher on Price as he came off the ropes! Up next, we were backstage where a number of NOTBPW wrestlers were choosing their entry numbers for tonight's Battle Royale...!! A group of fan favourites were choosing a randomly selected number from Jeremy Stone, when in walked Aldous Blackfriar and Mutant!! Such has been the star that Aldous and Mutant have made to their NOTBPW careers, many believe they are the favourites to go all the way tonight!! Neither man looked particularly happy with their numbers, and they tried to bully Mark Griffin into giving up his!! This was a hard-hitting triple threat match, with three bright stars of the NOTBPW roster. 'Mainstream' James Hernandez was able to sit back and watch for large portions of the match as Mighty Cavanagh and Tim Westybrook took lumps out of each other. Their feud is far from over, and their hatred for one another is clear. All three of these men had to keep something in the tank, as they're all in the Battle Royale later in the show – the only three men pulling 'double duty' tonight. Hernandez capitalised on a mistake from Westybrook late on, as the veteran attempted a running powerslam on his rival Cavanagh. As he hoisted big Cav onto his shoulder, Hernandez pounced and hit his 'Apparition #14' finisher! 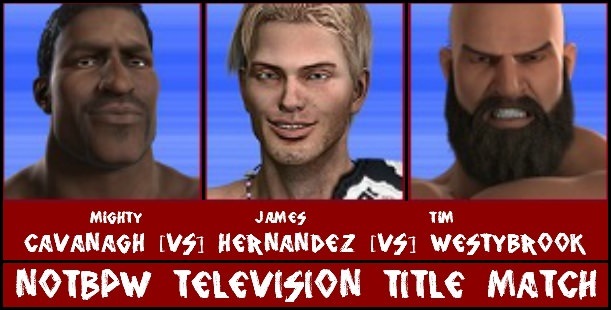 Cav hit the deck hard, and rolled out of the ring, and Hernandez rolled into the cover on Westybrook to retain his Championship! The two big men are still at war, and he's done well to stay out of their way – particularly tonight!! He hasn't lost since he debuted as part of the NOTBPW roster... after signing from CGC as their reigning World Champion over a year ago! But this past week on Championship Wrestling, Shaffer tried to facilitate a surprise attack, and he got destroyed!! Trent Shaffer and Gargantuan went for over 15 minutes in what must have been a gruelling outing for the former. Shaffer used his quickness, and agility to stay out of 'The Monster's' grasp early on, but he eventually came unstuck when attempting a dive from the top rope. Gargantuan swatted him out of the air with a big palm strike to the chest, and Shaffer splatted back first on the mat. From then on, it was one way traffic in terms of offence. Shaffer didn't get many shots in at all as his strikes just seemed to bounce off of Gargantuan's head and torso. Late on though, Shaffer began to come into it a little. He delivered a dropkick from the second rope that sent 'The Monster' staggering backwards, and he then attempted to chop the giant man down with kicks to the knees! In the end though, Gargantuan picked him up with a Military Press, and dropped him onto his knee for the 'Ultimate Backbreaker'. Nobody kicks out of that! 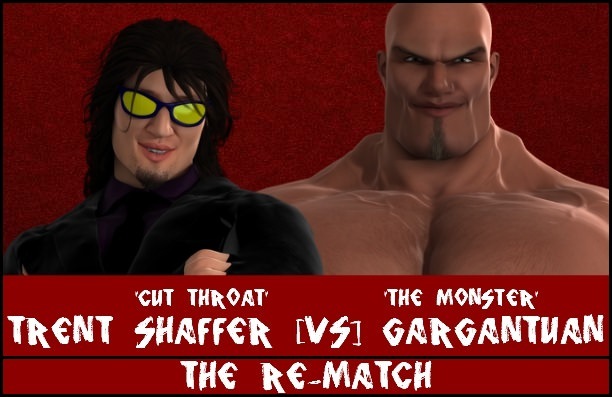 Shaffer said he had a plan to win, but it was just more of the same from him unfortunately... Will anyone be able to stop Gargantuan's rise?! We've had one instant classic DeColt versus DeColt match in 2017, when Steve DeColt took on Ricky DeColt in the Main Event of Championship Wrestling a few weeks ago. In fact, there has been at least one DeColt in 9 out of the top 10 matches of the year so far! Here tonight, it was no different. The only thing stopping it from being the perfect match, was the hokey finish, but more on that in a moment. Steve DeColt is a clever man, with a lot of size and strength backing him up. Against most men, he's the stronger and larger, but tonight, Jack DeColt matched him for both! Jack just isn't quite as switched on as his older brother, he's more of a brawler who would throw fists with absolutely anyone! It made for an interesting contest, as Steve used a lot of headlocks to try to control Jack, while the 'Wild Man' scratched and clawed and used all kinds of strikes! It wasn't an overly long match, leading to the announce team suggesting that there could be more to come from one of these men later tonight, but it was long enough to build slowly to a big finish. After around 8 minutes, Jack DeColt hit a brutal low blow behind the referee's back, and got away with it. From then on, the match changed a little, because Steve DeColt lost his 'wrestling mind' advantage, and just wanted to rip his brother's head off. The role reversal was remarkable in many ways, but Jack never lost his 'Wild' edge. Late on, both men entered into a fist fight reminiscent of a hockey brawl! Jack ended up being thrown shoulder first into the ring post! It was an even fight from then on, with Steve still selling the low blow, and Jack's shoulder clearly giving him problems. For the finish, Steve was looking to create separation and hit his 'DeColt Stampede', but Jack unleashed with ANOTHER vicious low blow. This one right in front of the referee! On deck next... it was time for the Super Slam Battle Royale...!!! Featuring 30 of the best NOTBPW wrestlers available, this match will be contested with Over The Top Rope Rules!! As soon as Mark Griffin got into the ring, Mutant made a statement by throwing Johnny Bloodstone over the top rope! This was a huge moment for the youngster, as Bloodstone is a well-decorated former multi-time Champion in his 15 year career. Mutant proved he's a force to be reckoned with in this match, when he got his FOURTH elimination by throwing Griffin out right before the ten second count down began! A man who will NEVER be a 'victim' headed to the ring next... The former three time World Champion Dan DaLay! At 320lbs, DaLay is a big, big man, and he stood toe-to-toe with Mutant for an awesome staredown. DaLay then unleashed with a barrage of punches, sending Mutant staggering into the corner. A few seconds later Mutant was down on the mat for the first time in the match following a wicked clothesline from DaLay. As the countdown began for the next entrant to arrive, Mutant was back up, and an all-out brawl was beginning... DaLay would have been hoping for some serious back-up!! If Dan DaLay could pick a man to come to the ring right then at Number Ten, he'd have picked Derek Frost for sure! His tag team partner and fellow veteran ran out and made a beeline for Mutant! Pretty soon, Aldous Blackfriar joined the fight, and it became two on two in this hard-hitting battle. DaLay and Frost perhaps had the better of the offence overall, but after 90 seconds, they were both down in the ring... Mutant made sure he picked Frost up, and dumped him out over the top rope at the buzzer...!! Again, Dan DaLay couldn't have picked a better Number Eleven than his own SON Robin DaLay!! Much like his father, Robin is a straight-ahead kind of guy, who hits what's in front of him, hard! What was in front of him was Mutant, and the big monster didn't back down despite a hard shoulder tackle. Robin then sent Aldous crashing into the turnbuckle with a shoulder tackle, and then he had one more for Mutant. Once more, Mutant was not phased by the tackle, and ended up crushing Robin with a hammer blow punch to the top of his head! Both DaLays were hurt! Erik Strong, much like Harrison Hash, dished out some punishment to the men in the ring. All of them were starting to get tired, particularly Mutant, who had been in the match for some time by this point. Strong couldn't take advantage on his own though, and he enlisted the help of Hash and the DaLays to try and get rid of the big man. But Tim Westybrook and Aldous Blackfriar stopped them from eliminating Mutant. Westybrook probably thought he'd be the next target if it worked! Mighty Cavanagh's arrival spelled the end for poor Erik Strong. He hadn't lasted long at all, but he was in the way of the big man. Aldous Blackfriar tried to fight Cavanagh on his own, and he too was thrown out over the top rope. Then came the fight between the two big men; Cavanagh and the dominant Mutant, who had at that point made SEVEN eliminations. He was exhausted though, having been in the ring for over 25 minutes! Cavanagh eventually tipped him up over the top rope right at the end of the 90 seconds! All of a sudden, the ring had three genuine contenders for winning the entire Battle Royale in it. Tim Westybrook, his rival Mighty Cavanagh, and the veteran Stone brother Duane Stone all had a legitimate claim to being the most decorated, and most talented, man in the ring. But Dan DaLay and his son Robin were really coming into their own at this point. They almost had Harrison Hash eliminated twice, but the buzzer sounded for the next entrant before they could get him over a third time! Business picked up in a big way again next, with the arrival of one half of the NOTBPW Tag Team Champions: Jacob Jett. The high flier sprung into action, taking down Harrison Hash, Robin DaLay and Duane Stone with head scissor take downs, before delivering well-placed kicks and strikes to Dan DaLay, Tim Westybrook and Dean Waldorf. To end the 90 second spell, Jett had an interesting fight with big Mighty Cavanagh, but nobody was eliminated. Aaron Andrews is finally HERE in NOTBPW!! He made an instant impression on the match when he tipped Robin DaLay up and over the top rope. Before he could eliminate him though, Dan DaLay threw himself in the way of Andrews to save his son! Unfortunately for Dan DaLay, Andrews eliminated him, and then got rid of Robin too! An impressive showing from both DaLays! Mighty Cavanagh also got in on the eliminations in this period, as he ended the stay of Harrison Hash – another decent showing. Yet another genuine potential winner entered the match next in the form of Edd Stone. The youngest Stone brother has had an interesting start to his NOTBPW career, including getting one over on Dan Stone Jr, Jeremy Stone AND Sean McFly inside his first six months back. Tonight, he and his brother Duane worked together and set to work taking down 'The Shooters', among others. It was time for some potential winners to eliminate each other next: Mighty Cavanagh and Tim Westybrook added fuel to the fire of their epic, long-running feud by stopping each other winning the match! It was a shame for Cavanagh, who was looking good up to that point. A late number for Donta Dunn, and although his occasional tag team partner Erik Strong had already entered and left the match, Dunn stood a good chance of winning it! He did an excellent job of taking Duane Stone down with his 'Sunny Daze' finisher – A brutal spinning back fist! With Duane down and out, the three 'Shooters' capitalised, and eliminated the veteran from the match!! Jacob Jett soon followed that up by pulling the ropes down to get rid of an onrushing John Maverick, right as the countdown began! A brilliant young prospect with a catchy entrance theme, and some great in-ring moves, arrived next! Sonny Wildside is just 22 years old, and is one of the youngest men on the roster. He immediately headed up to the top rope upon his arrival, and delivered a jaw-dropping moonsault to almost the entire ring full of talent as they brawled in the middle of it!! Widlside had taken almost everyone out, but the crafty Edd Stone almost took advantage of the youngster's inexperience and threw him out over the top rope as he celebrated!! Luckily for Wildside, he held on to the rope, and skinned the cat to get back in! Julian Watson hit the ring not long after his tag team partner John Maverick got himself eliminated. Nothing noteworthy happened upon his arrival, but a few moments into this 90 second period, Aaron Andrews managed to eliminate Ernest Youngman!! The other 'Shooters' were furious their friend was thrown out of the ring, and they tried to get Andrews up and over. But Sonny Wildside came up from behind, and Dean Waldorf and Marv Statler were simultaneously removed from proceedings!! Andrews gave a knowing look to Wildside, and thanked him for his help. James Hernandez made it ten men in the ring, and we had the last eight to enter all still alive in the match. It didn't take long for a couple of eliminations to occur though. Edd Stone got rid of Jacob Jett, who had had an impressive showing. Stone then followed that up by dumping Jett's tag team partner Thrill Seeker out! Then Ricky DeColt, not to be outdone by the young Stone brother, eliminated both Julian Watson and Donte Dunn! Sean Deeley once again almost had Sonny Wildside out, but he couldn't quite finish the job! With the final six comprising of Aaron Andrews, Edd Stone, Sonny Wildside, Sean Deeley, Ricky DeColt and James Hernandez, it was incredibly hard to pick a winner. With an average age of under 30, this group could represent the future of NOTBPW! Edd Stone didn't enjoy sharing the spotlight with so many fan favourites, and at one point, he slid out under the bottom rope and let the other five fight. He played a big part in Sean Deeley finally eliminating Sonny Wildside, as from the outside of the ring, he caused the distraction! Deeley didn't last long after that elimination, as Aaron Andrews almost immediately avenged his new friend Sonny! Once we had our final four, two separate fights broke out on opposite sides of the ring. Ricky DeColt was fighting Aaron Andrews, and Edd Stone was beating up James Hernandez. At the same time, the youngest brothers of their respective legendary families decided to Irish Whip their rivals across the ring. Hernandez ducked the clothesline attempt from Andrews, and when they hit the ropes, DeColt and Stone BOTH pulled the top rope down!! Hernandez and Andrews were both eliminated from the match in an unbelievable scene!! With three eliminations a piece, Edd Stone and Ricky DeColt were the finalists in the epic Super Slam Battle Royale. Who would have thought that it would come down to a Stone and a DeColt in the final two? With only three out of the thirty entrants members of the two illustrious families. The battle lines were drawn, and Stone and DeColt glared at one another across the ring. Their eyes didn't waver for a couple of moments, as they were both fixated on the other as they paced around the ring in a kind of 'war dance'. They finally locked up, and then all hell broke loose! Both men hit forearm smashes to the other's face, while landing high knees, and low kicks too! It got a little brutal for a moment, and Edd Stone suffered a bleeding nose due to a cut right across the bridge. It wasn't particularly severe, but you could see genuine hatred between the two young men. Through gritted teeth, Edd Stone flew at Ricky DeColt with what can only be described as a vicious lariat. The young DeColt brother looked like he'd been decapitated, and his torso, legs and arms landed with a thud! His head was, somewhere nearby, while Edd Stone licked his wounds in the opposite corner of the ring. He then mustered up the strength to dead lift the 240lb DeColt in a 'Gut Wrench' lift, and carry him over to the ropes. DeColt held on though, and he countered an attempted elimination with a brilliant spinning DDT! A knee in the corner, followed by another DDT put Stone down on the mat, but both men had taken a lot of punishment at the hands of the other by this point. Once they were up, Edd Stone delivered a super kick reminiscent of Ricky DeColt's finishing move, and then had the idea to head to the top rope. DeColt looked knocked out as Stone signalled for his 'Party's Over' Elbow Drop as he climbed, but DeColt remarkably kipped up onto his feet! Stone begged him not to, but DeColt didn't listen. He super kicked Stone's left leg out from under him, and he crashed down hard onto the turnbuckle. DeColt then shoved Stone over and out of the ring, while the bell rang, and DeColt was declared the winner!! Not only did Ricky DeColt earn a Title shot against him at Mid Summer Madness... But he also scored a controversial win over his other brother, Steve earlier in the show!! Last edited by The Lloyd : 05-18-2018 at 04:35 PM.